Mayo 0-11 Cavan 0-6 (Breffni Park, 17/2/1991). MAYO: E Lavin; K Beirne, D Kearney, D Flanagan; F Noone, T Tierney, J Finn; TJ Kilgallon (0-1), K Staunton; R Dempsey (0-1), C McManamon, J Leonard (0-1); N Durcan (0-1), T Morley (0-1), M Fitzmaurice (0-5). Subs: M Butler (0-1) for McManamon, McManamon for Staunton. Mayo 1-10 Antrim 1-6 (Crossmolina, 24/2/1991). MAYO: E Lavin; K Beirne, D Kearney, D Flanagan; F Noone, T Tierney, J Finn; TJ Kilgallon, C McManamon; M Butler, R Dempsey (0-1), J Leonard (0-1); M Fitzmaurice (0-4), T Morley (0-3), N Durcan (0-1). Subs: P McStay for Dempsey, J Jennings for Fitzmaurice. Mayo 2-7 Kildare 1-11 (Charlestown, 10/3/1991). MAYO: E Lavin; K Beirne, D Kearney, D Flanagan; F Noone, T Tierney, J Finn; TJ Kilgallon, C McManamon; J Leonard (0-1, free), R Dempsey (0-1, free), N Durcan; M Fitzmaurice (0-1), T Morley (2-2), A Finnerty (0-1). Subs: K Carey (0-1) for Finnerty, P McStay for Leonard. FIRST ROUND: London 2-9 Mayo 6-14 (Ruislip, 2/6/1991). MAYO: E Lavin; D Kearney, P Forde, D Flanagan; P Butler, T Tierney, F Noone; C McManamon (0-2), S Maher (0-2); M Fitzmaurice (0-2), L McHale (0-3), N Durcan (3-1); P McStay (0-2), T Morley (2-0), R Dempsey (1-1). Subs: M Collins for Forde, WJ Padden (0-1) for McHale. SEMI-FINAL: Mayo 3-11 Galway 0-6 (MacHale Park, 23/6/1991). 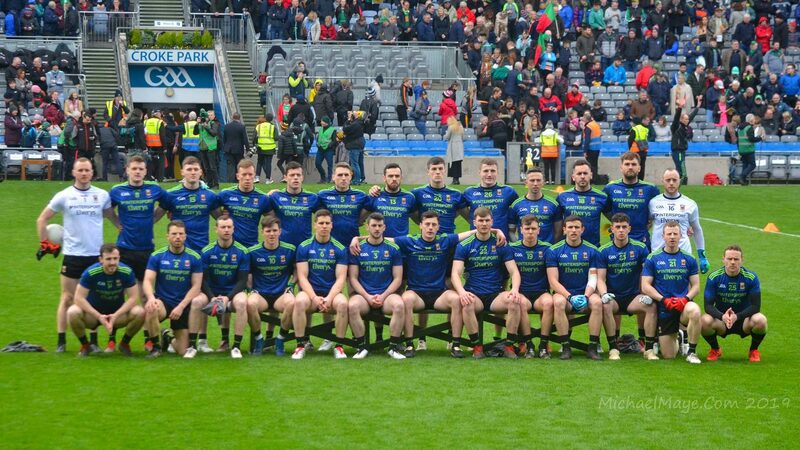 MAYO: E Lavin; D Kearney, P Forde, D Flanagan; P Butler, T Tierney, J Finn; TJ Kilgallon, C McManamon; M Fitzmaurice (0-6, all frees), L McHale, N Durcan (1-0); P McStay (1-2), T Morley (1-0), R Dempsey (0-3, one free). Subs: M Collins for Forde, F Noone for Tierney. FINAL: Mayo 0-14 Roscommon 0-14 (MacHale Park, 14/7/1991). MAYO: E Lavin; M Collins, D Kearney, D Flanagan; P Butler, T Tierney (0-1), J Finn; TJ Kilgallon (0-1), C McManamon (0-1); P McStay (0-2), L McHale (0-2), N Durcan ; M Fitzmaurice (0-2, frees), T Morley (0-2), R Dempsey (0-2). Subs: F Noone for Kearney, WJ Padden (0-1) for Fitzmaurice, S Maher for Kilgallon. FINAL (REPLAY) Roscommon 0-13 Mayo 1-9 (Dr Hyde Park, 28/7/1991). MAYO: E Lavin; A McGarry, P Forde, D Flanagan; P Butler, T Tierney (0-1), J Finn; TJ Kilgallon, C McManamon (0-1); P McStay (0-2), L McHale (0-1), N Durcan ; M Fitzmaurice (0-3, all frees), T Morley, R Dempsey. Subs: WJ Padden (0-1) for McManamon, A Finnerty (1-0) for Morley. Tyrone 0-18 Mayo 1-5 (Omagh, 27/10/1991). MAYO: E Lavin; F Noone, P Forde, J Gilmore; P Butler, T Tierney, J Finn; C McManamon, TJ Kilgallon (0-1); P McStay (1-0), R Dempsey, J Jennings; B Kilkelly (0-2), T Morley, M Fitzmaurice (0-2). Subs: N Stagg for Jennings, K Staunton for Jennings. Mayo 0-5 Cork 3-4 (Charlestown, 10/11/1991). MAYO: E Lavin; K Beirne, P Forde, J Gilmore; A McGarry, T tierney, J Finn; C McManamon, TJ Kilgallon; M Fitzmaurice (0-3, all frees), R Dempsey (0-1), T Morley; B Kilkelly, D Kearney, G Butler. Subs: K Carey for Butler, P McStay (0-1) for Fitzmaurice. Galway 1-9 Mayo 0-7 (Tuam Stadium, 24/11/1991). MAYO: E Lavin; K Beirne, P Forde, J Gilmore; A McGarry (0-1), T Tierney, J Finn; TJ Kilgallon, C McManamon; P McStay, T Morley, P Butler; J Leonard (0-1), D Kearney, R Dempsey (0-4). Subs: M Fitzmaurice for Butler, K Staunton (0-1) for McManamon. PRELIMINARY ROUND: Roscommon 0-10 Mayo 2-11 (Dr Hyde Park, 2/3/1991). MAYO: J McCallion; A Waldron, J Fallon, K Duffy; PJ Monaghan (0-1), T Hughes, N Connelly; C McManamon, K Staunton; J Jennings, R Dempsey, C Horkan (0-2); B Fitzpatrick (1-5), D Loftus (1-1), J Horan (0-1). Subs: J Conmy for Jennings, PJ Loftus for Dempsey. SEMI-FINAL: Leitrim 5-4 Mayo 0-14 (Pairc Sean MacDiarmada, Carrick-on-Shannon, 1/4/1991). MAYO: J McCallion; A Waldron, J Fallon, K Duffy; PJ Monaghan, T Hughes, N Connelly; C McManamon (0-1), K Staunton (0-1); J Jennings (0-3), R Dempsey (0-1), C Horkan; B Fitzpatrick (0-6), D Loftus, J Horan (0-1). Subs: T Prendergast (0-1) for Hughes, PJ Loftus for Horkan. SEMI-FINAL: Mayo 1-13 Galway 1-7 (MacHale Park, 23/6/1991). MAYO: B Heffernan; T Burke, J McSharry, K Mortimer; P Cunney, D Leyden, T Corcoran; P McNamara, M Smith; K O’Neill (1-1), R Ruane (0-6), R Golding (0-3); D O’Loughlin, D Burke (0-2), T Walkin. Subs: F Glynn (0-1) for Smith, F Costello for O’Loughlin, S Brady for Cunney. FINAL: Mayo 4-9 Leitrim 0-6 (MacHale Park, 14/7/1991). MAYO: B Heffernan; T Burke, J McSharry, K Mortimer; P Cunney, D Leyden, T Corcoran; P McNamara, M Smith; TJ McHugh (0-1), R Ruane (1-5, 0-2 frees), R Golding (2-0); K O’Neill (1-1), F Glynn (0-1), T Walkin (0-1). Sub: D O’Loughlin for McHugh. SEMI-FINAL: Mayo 1-12 Kildare 2-3 (Croke Park, 18/8/1991). MAYO: B Heffernan; T Burke, J McSharry, K Mortimer; P Cunney (0-2), D Leyden, T Corcoran; M Smith, P McNamara (0-1); K O’Neill (0-3), R Ruane, R Golding (1-0); D Burke (0-4), T Walkin (0-1), TJ McHugh (0-1). Subs: K Morley for Leyden, F Costello for Ruane, D McDonagh for Morley. FINAL: Cork 1-9 Mayo 1-7 (Croke Park, 15/9/1991). MAYO: B Heffernan; T Burke, J McSharry, K Mortimer; P Cunney, D Leyden, F Costello; M Smith, P McNamara (0-2); TJ McHugh, K O’Neill (0-1), R Golding (1-1); D Burke (0-3), T Walkin, D McDonagh. Subs: S Brady for McDonagh, C Deasy for McHugh.